A delegation of the NDDC Board visited with Liz Messner, owner of Aquatic Pets. I tease with the use of the word “delegation” because at the end of our visit, Liz revealed that she is a leader in the community of Waterford Township and we chatted a bit about Northfield’s recent annexation efforts. 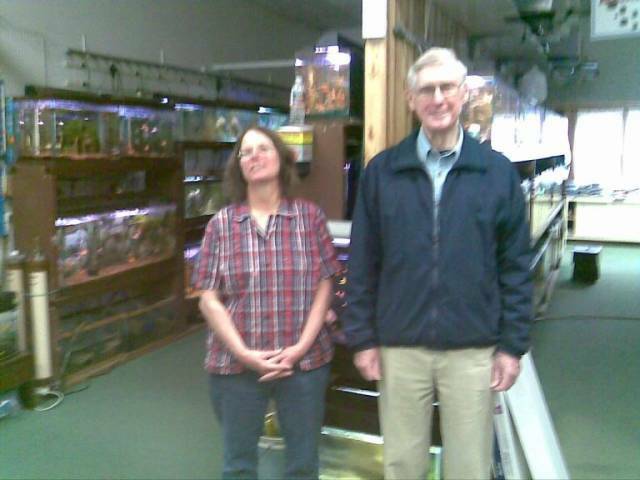 Aquatic Pets has been serving Northfield for 20 years, or since 1990, offering a wide variety of products for pets while focusing on the aquatic variety. They’ve occupied three locations in downtown during that time, on the west side of Dahomey Avenue (Highway 3), at the corner of Dahomey and Second Street, and now right in the heart of Northfield on Division Street. Liz loves her Division Street location. She says downtown is great; everything is within walking distance, making it convenient for multiple tasks. Liz says that each store benefits from the others’ traffic and notices that when people come into her store they are often carrying bags from other shops. When asked how the NDDC might better serve her business, Liz suggested more coordination of district advertising. She advised that themes promoting the diversity of retail offerings in downtown and celebrating the independent ownership would be powerful messages. She also recommended work on a program that subsidizes the cost of meeting HPC standards for building facades. Liz identified parking as a problem of perception for downtown. She noted that if the connections between parking and retail were clear and attractive, this might help. While on this topic, she noted that the sidewalk and curb maintenance in downtown could be better. Finally, Liz shared her concerns about rising commercial property taxes. Although she offered that she has a great landlord who has shielded her business from these costs so far, she hears many stories of financial stress caused by this increasing burden from other local business owners. Taxpayers should speak up about what services are truly essential, she advises. Maintaining the existing infrastructure and supporting existing businesses, she believes, should be Northfield’s top priorities.